I hope you can understand that it seems to be a weird idea to report about scuba diving facilities and activities in Coron, since an estimated 90% of all non-locals came especially for this reason to Coron the first time. And truly at the time most of the current “non-native” residents came to Coron there was not much more than a few dive shops and it was perfect this way for most of us. With the big variety of activities offered today of course, most tourists are non-divers and those who are among them should definitely give it a try: guys, you don’t know what you’re missing!! For your convenience I copied it here but of course the credit goes to them. Keep in mind that when planing to have a dental treatment while staying in Coron, to please inform your dentist that you are an active scuba diver. Your treatment can be adjusted so that you do not need to worry about any inconveniences or tooth-pain related kill-joys while enjoying your next dive. 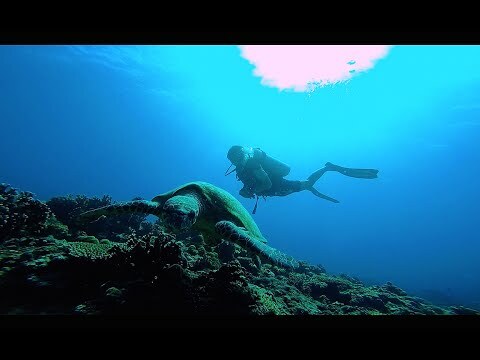 Although Coron is justly famous for its wreck diving it is now fostering some excellent reef diving too. The implementation of fish sanctuaries, together with education programmes aimed at curtailing the use of dynamite and cyanide when fishing, is having a marked effect and the coral is re-establishing itself at a remarkable rate. In fact, much faster than the scientists would have us believe possible! With this in mind Seven Islands, near to Coron town, and Calambuyan Island, on the way up to Concepcion, are a couple of great sites that are well worth a visit. The variety of diving in this area is enormous and ranges from 11 World War Two Japanese wrecks at depths from 12 to 43 meters, caves, a geothermal hot lake, coral reefs and walls. Diver training is available from Discover Scuba Diving through Advanced Nitrox and Wreck penetration to Divemaster, together with comprehensive Technical Diving instruction, but excluding Tri-Mix. Learn to dive in the warm, calm waters of Coron bay. Wreck diving in Coron is a full day trip for two or three wreck dives. You will be aboard a ‘banka’, traditional outrigger style dive boat, all day and the normal departure time is 09:00am. Lunch is served and prepared on-board by extremely friendly and professional crews by most resorts. You can choose to dive with a buddy or be guided. You determine your NDL and watch your air supply. We don’t limit the time of your dives. It is a one hour/+ boat ride to the first dive site, depending on which boat you are sailing. The usual procedure is to dive a wreck and then go off to a beach or shallow wreck for two hours of lunch, snorkeling, and swimming. 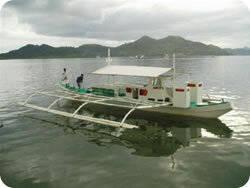 A second wreck dive is followed by an hour, to an hour and a half, cruise back to Coron town. The boats usually return between 4:00 and 6:00pm, depending on whether two or three dives are made, and the location of the last dive. 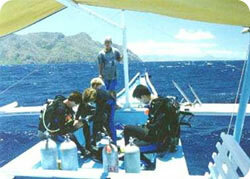 Dive guides accompany groups of four to six divers if needed. Groups are divided according to experience levels. Novices never have to chase advanced divers into small dark holes. Two experienced advanced open water divers can buddy up and plan their own dive after consulting with the dive leader. Two wreck diver specialty certified divers can plan their own penetration with proper equipment. 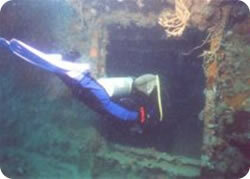 Limited interior access is allowed for advanced or experienced divers, who stay in the light zone within the wreck. The PADI Wreck Diver Specialty class is available for those divers who have completed Advanced Open Water and who desire to learn to make their own penetration. There is a recompression chamber in Coron but we have no wish to use it. We are very careful with our dive profiles and dive planning to avoid decompression sickness p roblems. The boats we use have heads(bathrooms), drinks, water and covered areas for shade but please ensure you bring your own sun block and a hat. The ‘Look Sea’ diving banka, available for charter complete with experienced crew. Contact us for details! Here are some impressive pictures from around the various dive shops in Coron – hope you enjoy.